At the AIA Northern Virginia Chapter House, 1101 Duke Street, Alexandria 22314. 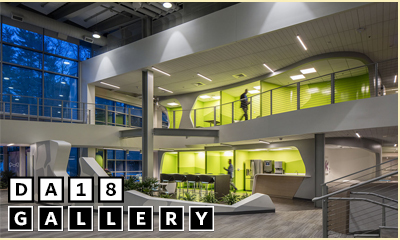 AIA Northern Virginia's 2019 Open House welcomes members, board members, committee chairs, guests, sponsors and students to visit the Chapter House to socialize and get to know the Chapter leadership face-to-face. The event falls on Mardi Gras every February, is frequently postponed by weather, and offers creole-inspired food and cocktails. Celebrate Mardi Gras at our Annual Open House, featuring food from Southside, a King Cake flown in from New Orleans and Debbie's famous Hurricanes. This event is free and reservations are not necessary. 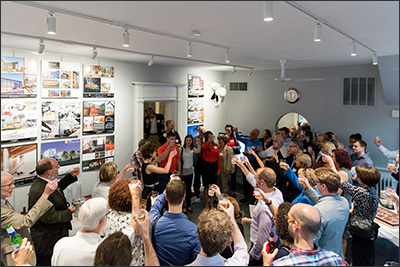 Members toast Newly Licensed Architects at the new Chapter House, fall 2016. 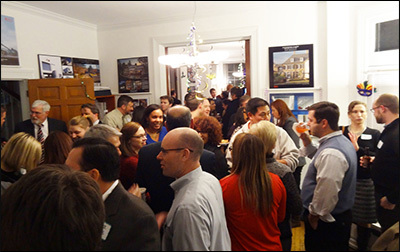 Guests enjoy the company at an Open House in our previous location. The new Chapter House is located at 1101 Duke Street. Street parking is available. The Chapter House is also accessible from Metro's King Street Station. You can walk down King Street to Henry Street and turn right - the Chapter House is two blocks down on the corner with Duke Street, (about an 8-block walk). Or hop on the free King Street Trolley which runs every 15 minutes down King Street connecting the Metro station to the waterfront. There is a stop at the corner of King and Henry streets.